FOMO is back, and there isn’t one weedstocks investor who’s not celebrating. Outsized gains are everywhere, good news is being rewarded, and euphoric sentiments are commonplace. These massive multi-week runs are exactly why investors can’t get enough of the sector. But nothing lasts forever. If there’s anything the past three years have taught us, it’s that high retail participation has exerted an outsized influence on price. In a sense, the market is held hostage to the manic swings in investors sentiment, which fluctuate on a week-to-week basis. While sentiment is elevated now, it is guaranteed to flip. Whether this upcoming shift is triggered by next week’s batch of earnings, some yet-unknown bearish development, or general buying exhaustion—sentiment will change. After rising ↑36.00% (!) is January alone, Canadian weedstocks have added another ↑7.17% through the first two sessions in February. Most people would characterize that as “frothy”, especially without an obvious corresponding catalyst to backstop this enormous strength. That’s not to suggest the party is over—yet. With every Canadian Tier-1 licensed producer trading significantly above its 50-Day simple moving average, and with majors still trending higher on hourly charts without lower-low breaks, further gains are possible. There’s even chatter that another CPG/Pharma conglomerate may be on the precipice of staking another equity position, fueling sentiment further. 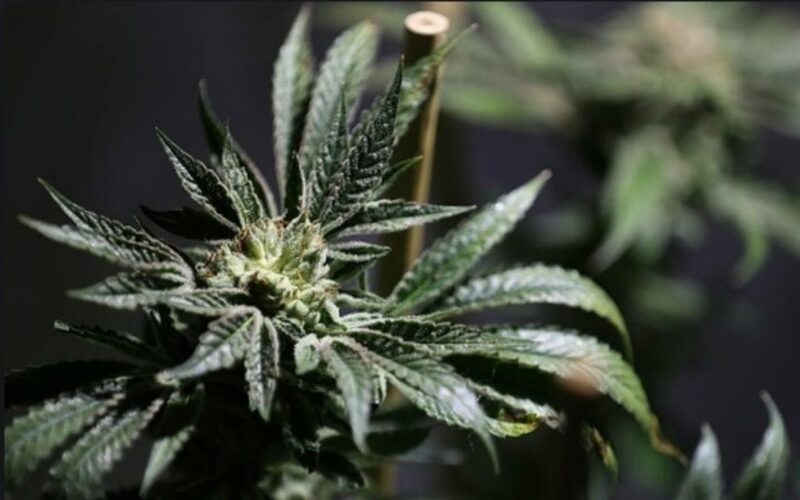 Whether new partnership emerge or not, perception is reality in weedstocks; and that perception is one such catalyst boosting Aphria and Aurora Cannabis at the moment. Ironically, the tremendous sector strength poses somewhat of a quandary to the average buy & hold investor. It calls into question to which degree profits should be taken here, with windfall gains coming so quickly. Many Canadian LPs have returned triple-digit percentage gains in mere weeks. However you decide to allocate your portfolio, Midas Letter delivers three protective maneuvers investors can employ to minimize the upcoming impact FOMO-in-reverse will inevitably exert on investor portfolios. We urge you to give them consideration, taking into account individual goals and happenstance. One of the primary reasons why FOMO is so pervasive is that investors cannot stay un-invested. It’s the nonsensical viewpoint that cash is but a transitory gateway towards additional equity purchases, rather than a position itself. The urge to splurge with the market running is simply too tempting for many—even if that means buying at unattractive levels. So is the concept of seller’s remorse, or the temptation to chase stocks higher over disdain of selling positions too soon. Among the better ways to combat FOMO-itis to rotate profits into non-redeemable short term guaranteed investment certificates (GIC). Terms as low as 30-days can be procured, allowing your money to index to inflation while the cannabis market cools down. Not only is it a great way of avoiding the temptation of reflex harmful trading, it allows investors to refocus on the next great investment opportunity. Because having money sit idle in brokerage account purgatory—ready to be deployed at impulsive notice—ends badly for many people. If you’ve purchased positions in anticipation of movement, and you’ve been disappointed with the results, consider cutting the cord before it gets messy. Positions that refuse to move in-tandem with sector tendencies usually indicate the market is telling you something. It could be that your investment thesis was erroneous, or that it was simply before its time. Whatever the case—barring strong individual news flow—if stock XYZ hasn’t moved strongly in this environment, it’s increasingly unlikely to do so as this FOMO-infused rally matures. By trimming laggards early, you avoid the decision of waiting through the inevitable bleed-out—where laggards maintain a strong chance of going under water. This saves an incalculable amount of time and focus going forward—energy better deployed on new weedstocks opportunities waiting over the next horizon. If technical analysis isn’t your thing—or perhaps you’re a poor market timer—consider taking profits once a material 2-hour closing lower-low has printed. Doing so takes the guesswork out of positioned exits, and will generally get you out within 10-15% of a market rally. It also affords enough leeway to avoid selling minor pullbacks too early, which thwarts seller’s remorse. 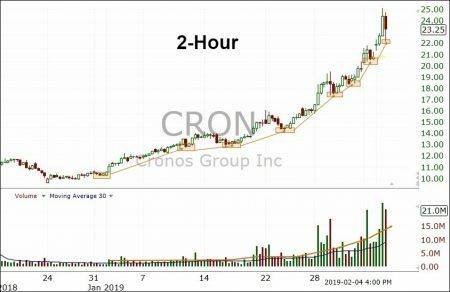 As an example of the latter, let’s take the recent price action in Cronos Group. If we simply waited for closing breaches in definable 2-hour swing points and gaps, we could have rode the entire January rally without exiting. At some point, a new lower-low will form and take prices meaningfully away from the highs. But most investors are exceptionally poor market timers, and letting mechanical exit techniques rule often yields better results vis a vis subjective exits. The key is nailing down the “definable” higher-lows in the chart, which can be tricky on occasion. But with a little practice, most anyone can do it. The more systematic buying and selling signals become, the lower the chance emotions can sweep in and mess everything up.